By Jack Penm and R.D. Terrell College of Business and Economics The Australian National University. 2 Can currency short selling decisions diversify a currency investment portfolio? Can an investor buy one short-term bullish currency, and short sell another short-term bearish currency? Can an investor buy one short-term bearish currency, and short sell another short-term bullish currency? Can Granger causal relations exist between an exchange rate and a price index? 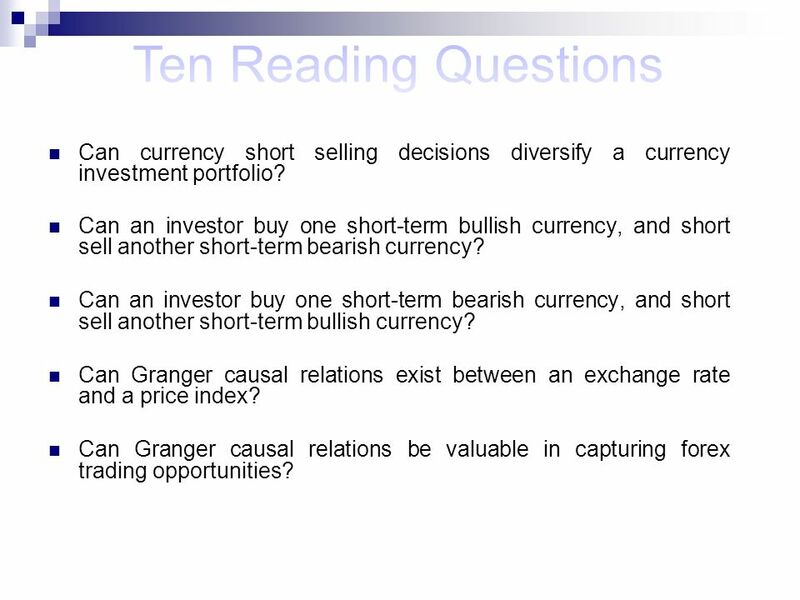 Can Granger causal relations be valuable in capturing forex trading opportunities? 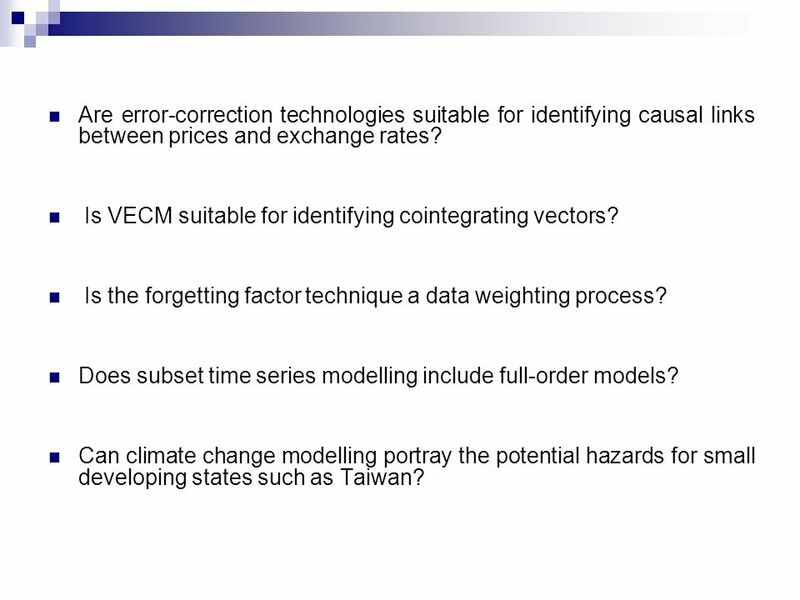 3 Are error-correction technologies suitable for identifying causal links between prices and exchange rates? Is VECM suitable for identifying cointegrating vectors? Is the forgetting factor technique a data weighting process? Does subset time series modelling include full-order models? Can climate change modelling portray the potential hazards for small developing states such as Taiwan? 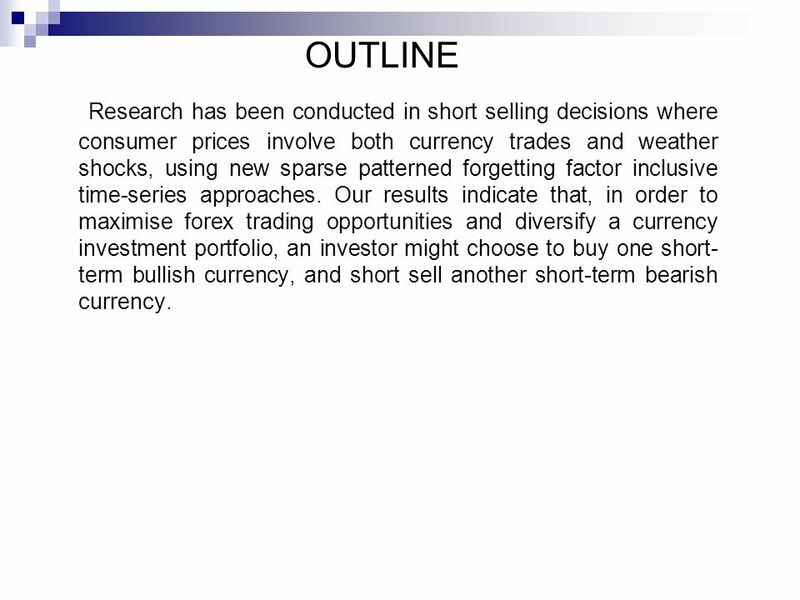 4 OUTLINE Research has been conducted in short selling decisions where consumer prices involve both currency trades and weather shocks, using new sparse patterned forgetting factor inclusive time-series approaches. Our results indicate that, in order to maximise forex trading opportunities and diversify a currency investment portfolio, an investor might choose to buy one short- term bullish currency, and short sell another short-term bearish currency. 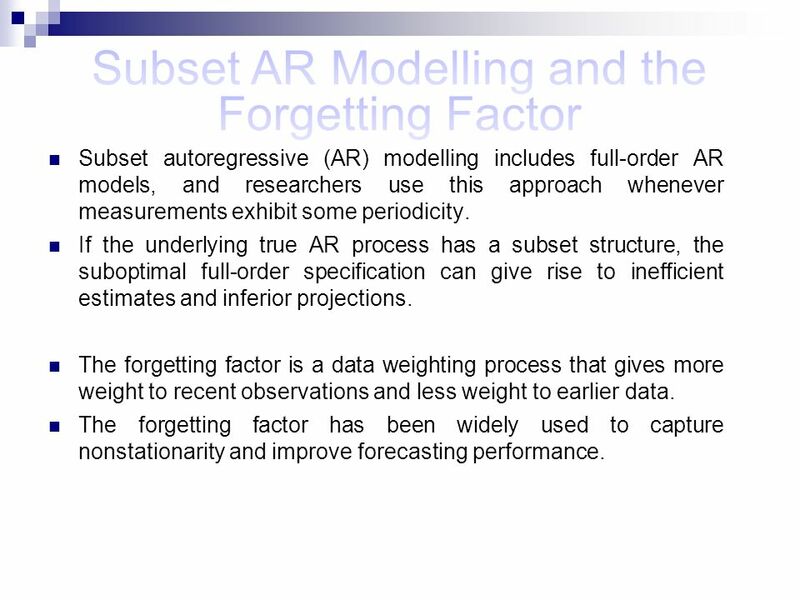 5 Subset autoregressive (AR) modelling includes full-order AR models, and researchers use this approach whenever measurements exhibit some periodicity. If the underlying true AR process has a subset structure, the suboptimal full-order specification can give rise to inefficient estimates and inferior projections. The forgetting factor is a data weighting process that gives more weight to recent observations and less weight to earlier data. The forgetting factor has been widely used to capture nonstationarity and improve forecasting performance. 6 In vector time-series analysis, VECMs have become an important means of detecting Granger causal relations and cointegrating relations. Commonly employed full-order VECM models assume nonzero entries in all their coefficient matrices. 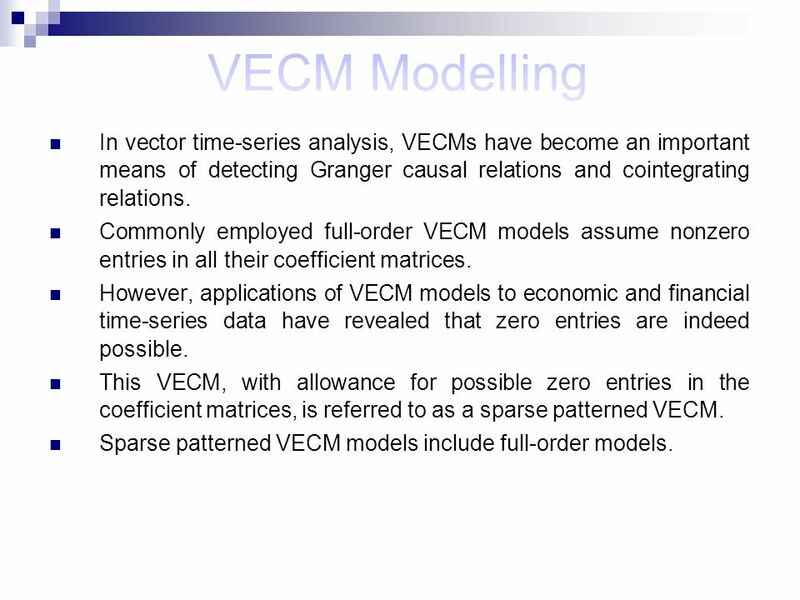 However, applications of VECM models to economic and financial time-series data have revealed that zero entries are indeed possible. This VECM, with allowance for possible zero entries in the coefficient matrices, is referred to as a sparse patterned VECM. Sparse patterned VECM models include full-order models. 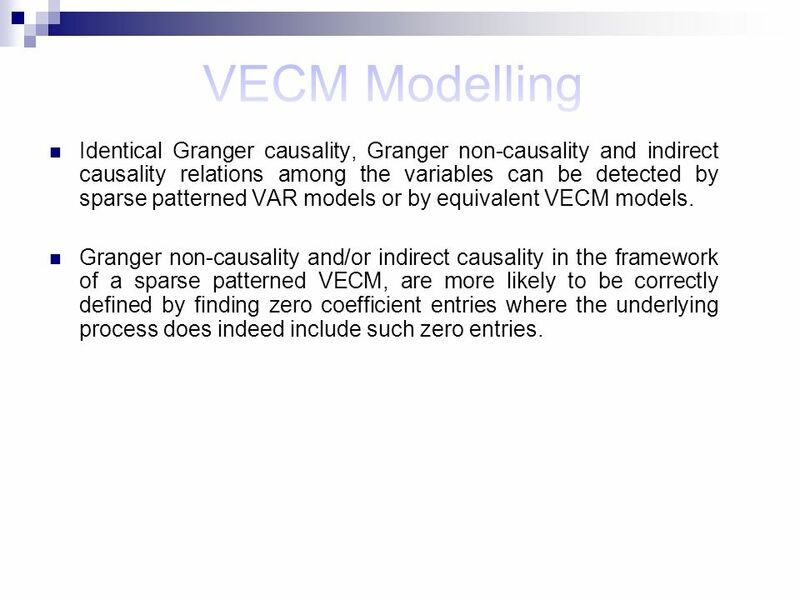 8 Identical Granger causality, Granger non-causality and indirect causality relations among the variables can be detected by sparse patterned VAR models or by equivalent VECM models. 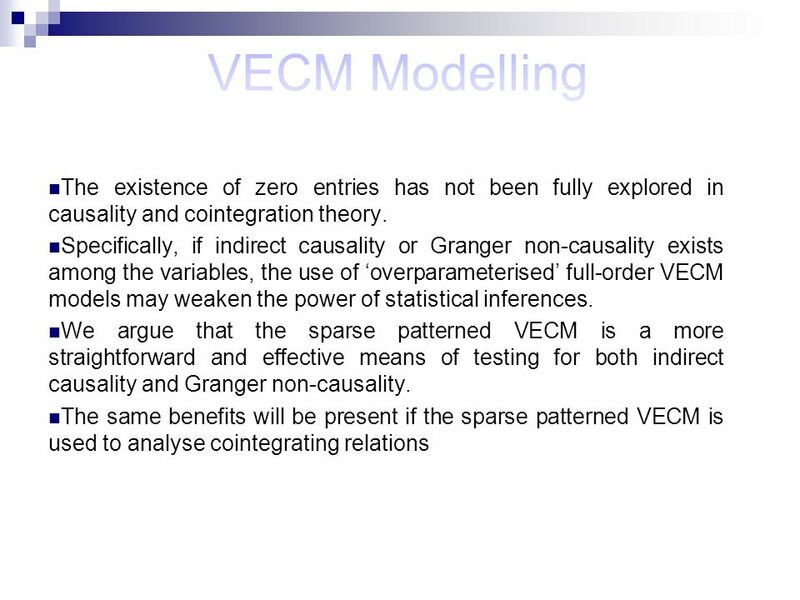 Granger non-causality and/or indirect causality in the framework of a sparse patterned VECM, are more likely to be correctly defined by finding zero coefficient entries where the underlying process does indeed include such zero entries. 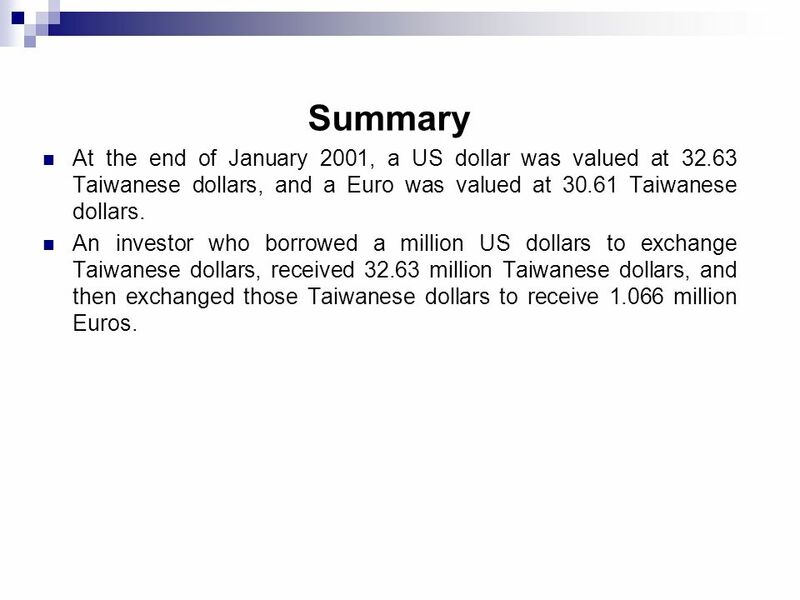 9 Summary At the end of January 2001, a US dollar was valued at 32.63 Taiwanese dollars, and a Euro was valued at 30.61 Taiwanese dollars. 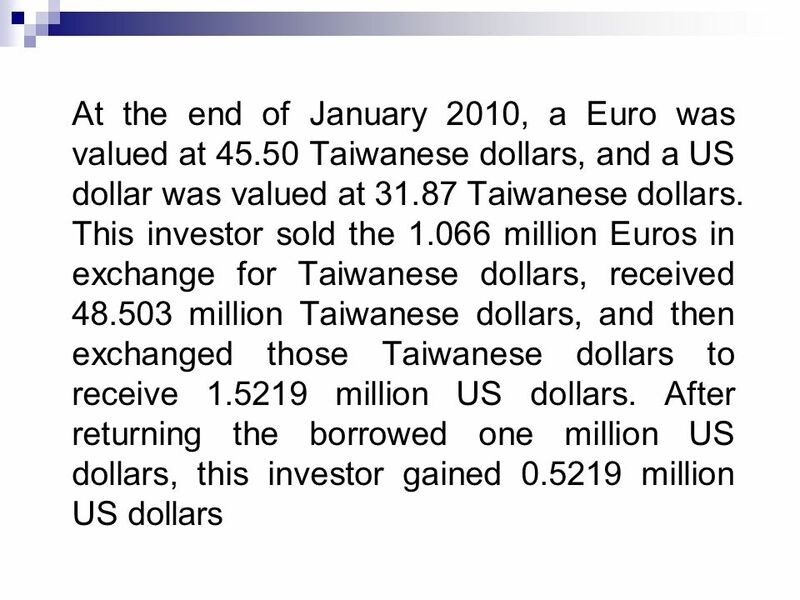 An investor who borrowed a million US dollars to exchange Taiwanese dollars, received 32.63 million Taiwanese dollars, and then exchanged those Taiwanese dollars to receive 1.066 million Euros. 11 The paper presents the causal links between exchange rates and macroeconomic price indices, in complex forex short selling environments. This approach can be used to guide further appropriate use of data in changing currency trade environments. 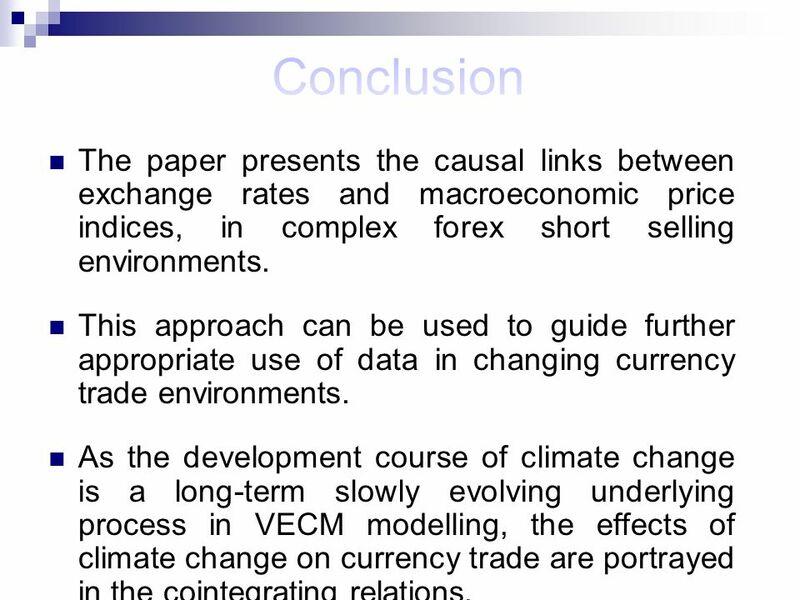 As the development course of climate change is a long-term slowly evolving underlying process in VECM modelling, the effects of climate change on currency trade are portrayed in the cointegrating relations. 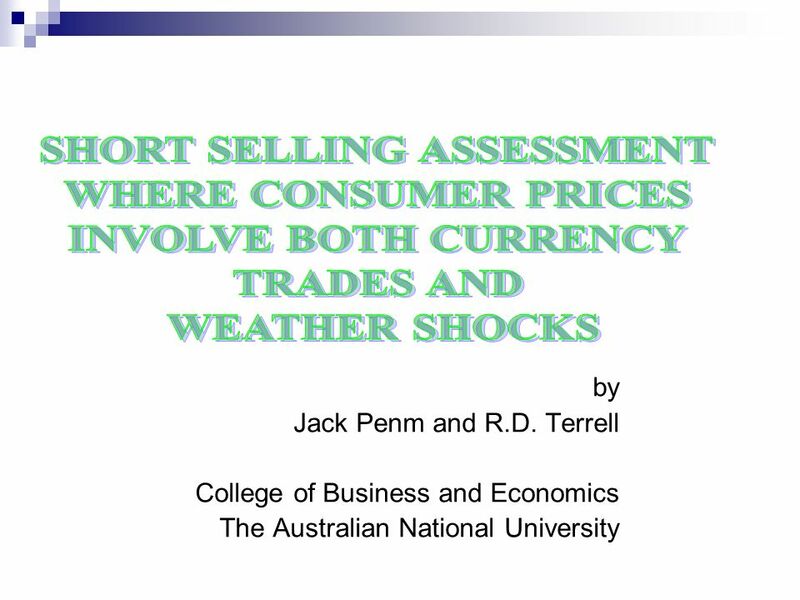 Download ppt "By Jack Penm and R.D. Terrell College of Business and Economics The Australian National University." IX. EVALUATING TRADING STRATEGIES AND PERFORMANCE. Structural modelling: Causality, exogeneity and unit roots Andrew P. Blake CCBS/HKMA May 2004. Long run models in economics Professor Bill Mitchell Director, Centre of Full Employment and Equity School of Economics University of Newcastle Australia. © 2012 Cengage Learning. All Rights Reserved. May not be copied, scanned, or duplicated, in whole or in part, except for use as permitted in a license. Business Forecasting Chapter 3 The Macroeconomy and Business Forecasts. Benefits Returns not correlated to traditional portfolios Aims to profit in both rising and falling markets using long and short trading strategies Robust. International Finance Chapter 5 Part 2: Forecasting Exchange Rates. McGraw-Hill/Irwin Copyright © 2008 The McGraw-Hill Companies, Inc., All Rights Reserved. Behavioral Finance and Technical Analysis CHAPTER 9. Exchange-Rate Determination Chapter 12 Copyright © 2009 South-Western, a division of Cengage Learning. All rights reserved. Portfolio Management Lecture: 26 Course Code: MBF702.